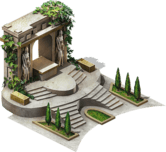 The Altar grants benefits to your empire when active. Execute a Hero to activate the Altar. Only players with a Stronghold level of 15 or higher may execute Heroes, or have their Heroes executed.